Despite the risk carried by Mt. 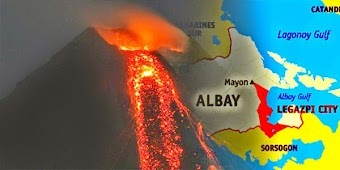 Mayon eruption in Albay, apparently, the event seems to have a positive impact after all. In fact, people thinks Mayon volcano as "blessing in disguise" because it continues the growth of tourism as spectators would like to witness the volcanic activities. Furthermore, it may increase the income of entrepreneurs in the province, as well as the local government. Among foreigners, even local tourists are coming to take photographs and videos of the erupting volcano. However, authorities implemented strict restrictions on entering the 6-kilometer permanent danger zone at the foot of the volcano for the security of the public. Where To Stay To Watch An Eruption? Lignon Hill Nature Park perfect viewing location for Mayon spectators. If these areas were authorized, well, as part of visiting the province some are prohibited. Like riding ATV (all-terrain-vehicle) towards Mayon, playing golf in Dona Pepita Golf Course, even going to the Mayon Rest House, and other activities that covered 6-kilometer permanent danger zone and 6-8 kilometer extended danger zone. The Philippine Institute of Volcanology and Seismology (Phivolcs) focused more on Mayon Volcano's eruption because it is expected to take place eventually the next day or next week. Experts suggested that the powerful explosion maybe intensified when volcano took its temporary dormant right after the last eruption occurred in 1984 and 2009. Meanwhile, Phivolcs announced, there is a massive lava dome accumulated in the crater of Mayon Volcano, from the previous volume of 560,000 last Monday, it increasing to 855,000 cubic meters. When another mass of flowing magma push this lava dome, this will bring set of earthquakes. Thank you for reading Mayon Volcano Eruption Becomes Tourist Attraction posted on the website Kwentology if you want to redistribute this article please include the link as the source. Have some kuwento to share? Contact us!